Excitement is building in Clonmel Theatre Guild as the countdown is on to the 50th anniversary of its formation on 23 February 1969. On that momentous night a group of members of the drama group attached to St Mary’s Choral Society decided at a special meeting in Hearn’s Hotel to form themselves into a separate organisation to be known as the Clonmel Theatre Guild. Over the past 50 years the guild is proud to have staged 110 productions bringing amateur theatre to the people of Clonmel & environs. The repertoire covered has been varied and impressive and whether it has been a play in the White Memorial or comedy at dinner theatre, the guild has always strived to bring the best to its patrons who have always enthusiastically supported its efforts. 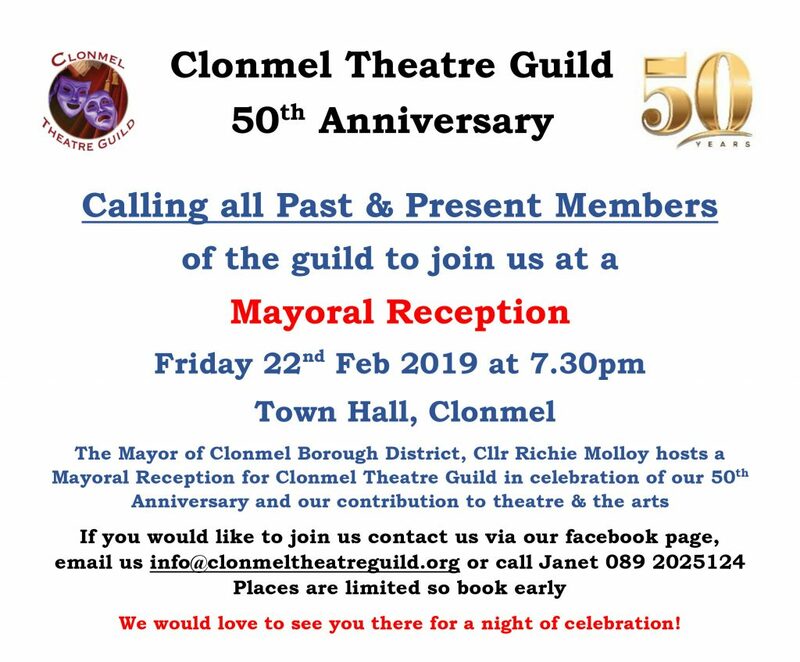 In recognition of the Guild’s contribution to the arts and cultural life of Clonmel and to celebrate it 50th anniversary, the Mayor of Clonmel Borough District, Cllr Richie Molloy is hosting a Mayoral Reception for the guild on Friday 22 February 2019 in the Town Hall at 7.30pm. Clonmel Theatre Guild is calling on all its past members to come along on the night and be part of this celebration. Places are limited, so if you would like to attend, please contact us by email info@clonmeltheatreguild.org, message us via our facebook page or call Janet on 089 202 5124. Guild Chairperson Carol Acheson said “the members of guild today stand on the tall shoulders of all those who have gone before us. We would not be here but for the tremendous work they lovingly undertook over the past 50 years. Please do join us at these celebrations, we look forward to seeing you there”.